Every real ice rink hire installation is different. From the start, our team will provide you with estimates on your proposal, amending it every time we get more information about what it is you want from a real ice rink installation and the benefits you want it to deliver. At the same time, we’ll use our 13+ years of experience in doing everything we can to mitigate the costs so that the project fits into whatever budget you have allocated from it. From time to time, it may even be possible to install a real ice rink on a temporary basis for free. 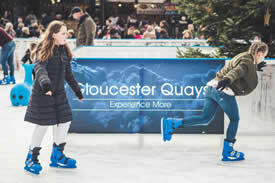 The Christmas Ice Rinks managing director and his team have many connections across a wide range of sectors experienced in exploiting the commercial opportunities a real ice rink brings so that upfront and ongoing running costs are either partly or wholly offset by income from other sources. What adds to the cost? What brings down the cost? Work with the Christmas Ice Rinks team and we can put together a convincing and cogent business plan to your public or private sector organisation for the installation of a footfall-generating, publicity-raising, consumer-focused temporary real ice rink facility.